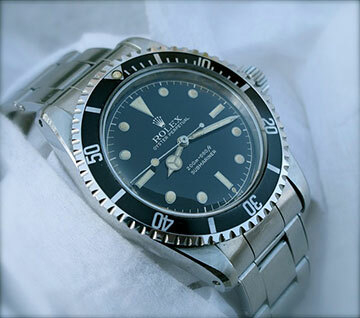 The 1950s to the mid 1960s was a golden era for Rolex. Watches produced by the company during this time have captivated the hearts and minds of Rolex collectors for many years. The passion that drives many watch collectors is the desire to find not just older watches, but to search for vintage watches whose dials have been well preserved and protected from the elements and at the same time, have aged in a way that each has taken on a unique patina. Thanks to the introduction by Rolex of it’s patented Oyster case with its improved screw down case back and winding crown, many of these dials have survived today giving collectors much to be happy about. The dials produced for the Rolex Submariner and GMT during this time are known by collectors as gilt-gloss or gilt/gloss dials. The term gilt, as applied to these early Rolex dials, refers to both the gold tone of the text as well as other features of the dial. While many collectors may not feel that the term gilt is appropriate when used in this context, it has stood the test of time, and as any collector with a passion for Rolex dials can tell you, it is a far better description than the names given to identify some other dials. 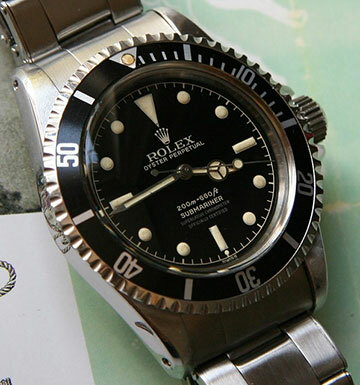 The term gloss describes the mirror like black glossy surface of these dials, which is in contrast to the matte finish which was introduced by dial manufacturers for Rolex watches in the mid 1960s (two pictures below courtesy of Tomvox). The manner in which these gilt-gloss dials were produced is very interesting. While some dial manufacturers might paint the text on the colored surface of the dial, those making the dials for the Rolex Submariner and the GMT did so in a way that the gold colored text and features are in relief or below the surface instead of on top. These gold aspects of the dial are actually the brass dial plate and lie underneath a coat of black glossy paint. On top of the black layer of paint, a clear coat of lacquer was then applied . In the case of the very early gilt-gloss dials, it was not uncommon to have lines of silver colored text in addition to the gold colored text. The silver colored text was applied on top of the final clear lacquer coat. Finally, the luminous material that allowed the watch to be read in the dark was applied. The more radioactive radium used for the dial and hands in the 1950s to make them glow was swapped for the less radioactive tritium in the early 1960s. The way these dials have aged is at the heart of why these watches are so favored by vintage Rolex collectors. Just as no two fingerprints are the same, the same can be said of these early Rolex dials. 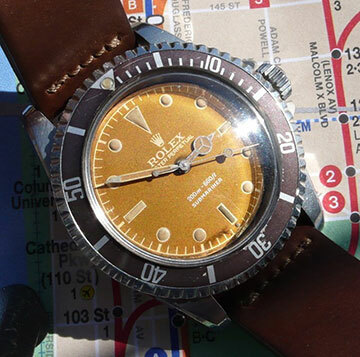 It is not uncommon for the dials produced in the 1950s to have a darker more orange color to the text on the dial, while many others that were produced later tend to have acquired more lighter shades of gold tone. The difference between the two is likely due to the radium versus tritium used for the luminous material and how the brass dial plate reacted with the chemicals used to prevent corrosion during the manufacturing process. Another beautiful feature of these rare watches is the appearance of the glossy dial in different lighting conditions. The richness of the black high gloss finish of many dials can be readily seen in the sunlight, while other dials exhibit different shades of brown. Another reason these early Rolex models are sought after by enthusiasts is because of the attractive styling of the watch case. As hobbies evolve and collectors become more knowledgeable, it’s common for the emphasis placed on certain aspects of the objects collected to change over time. Vintage watch collecting is no exception. Within the last five or six years, collectors have moved away from the mantra, “It’s all about the dial” and adopted a more progressive maxim, “A great watch starts with a great dial, but doesn’t end there”. Both the Rolex Submariner reference 5512 and its predecessor, the Submariner 6538, share the large chamfers or beveled edge on the lugs of the watch case that are prized by collectors. In recent years collectors have realized that unmolested examples with their sharp cases nearly intact are rare treasures. 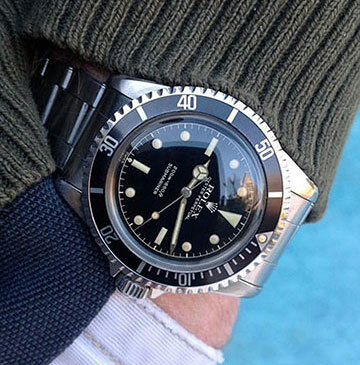 The Rolex Submariner reference 5512 was introduced in 1959 and was likely produced until 1980. Early examples were fitted with the calibre 1530 movement, and the improved chronometer rated 1560 movement was introduced a year or so later. The 5512 shared some of the styling features of the earlier Submariners like the outer rotating black bezel that helps to keep track of elapsed time. 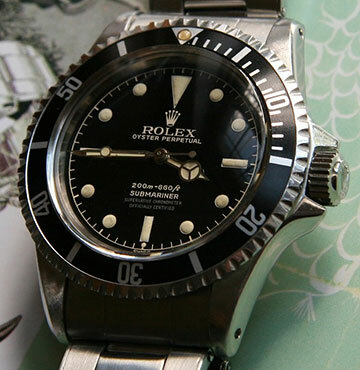 However, unlike the earlier Submariners, the watch case produced for the 5512 featured crown guards on either side of the winding crown, a feature that remains on the Submariner to this day. The many different gilt-gloss dials combined with the different shaped crown guards are some of the unique features of the 5512 that make this sporty and elegant reference a favorite of vintage Rolex collectors. Understanding the chronology and significance of these early dials is a passion of mine. From a collector's perspective it is important to be able to evaluate a vintage watch based on its originality and period correctness. 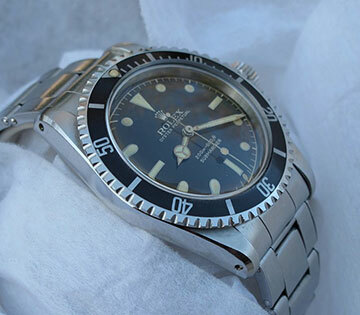 Unfortunately, not many collectors have the ability to locate vintage watches from original owners, and because the provenance of other watches is not always clear, understanding the significant changes in the evolution of this Submariner is critical in making sure that the watch has the correct movement and dial. The following is a brief overview of the 5512 discussing some of the more common and rare gilt-gloss dials and their characteristics as well as a short summary of the different types of crown guards and movements from 1959 to 1966. 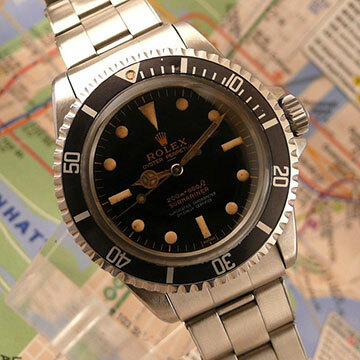 There are few hard and concrete rules with Rolex during this period, and as such, this overview should NOT be seen as a conclusive authority to check the correctness of your vintage Rolex, but rather a guide to help collectors appreciate the many subtle nuances of the 5512 from the early to mid 60's. A warm thank you to Andrew Shear for allowing the pictures from his dial archive for this 5512 review.